The three Republicans who lead Texas state government have made it clear: They know what the state’s top problems are and they’re working together to fix them now, during the brief window they get every two years. But resolutions on those consensus issues have — predictably — proved harder to settle on. As the 140-day session marks its halfway point this week, must-do reforms to the state’s property tax and school finance systems remain only partially baked. A property tax bill originally filed with identical language in both chambers remains in purgatory, with approval from the Senate’s property tax committee but without a vote from the full body; in the House, it’s yet to advance past the panel. And the chambers are perhaps further apart on the second priority issue, school finance. The House is charging ahead on its version, but an as-yet unfinished Senate proposal takes a different tack. But even with the different approaches the Texas Senate and House have adopted on those two issues — and despite the pace that’s causing some at the Capitol to worry about getting it all done in time — Lt. Gov. 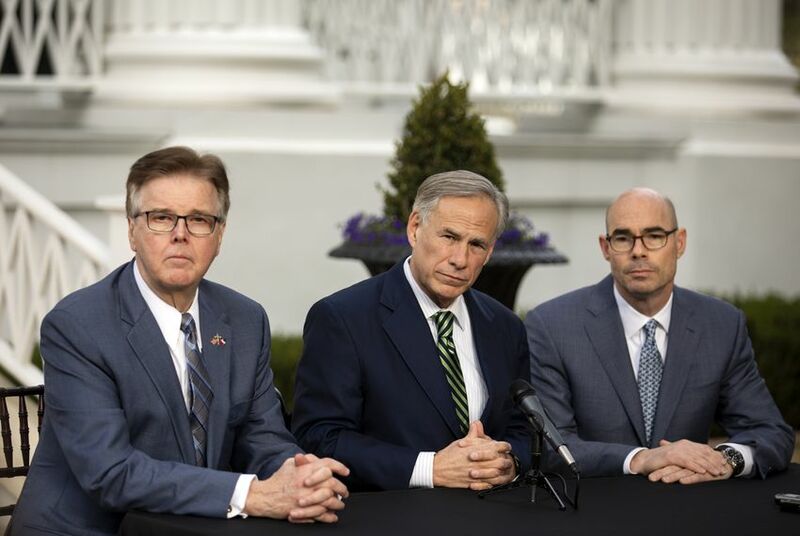 Dan Patrick and House Speaker Dennis Bonnen, along with Gov. Greg Abbott, appear determined to keep the negotiations civil, at least in public. In the Legislature's recent past, personal feuds stymied policy priorities; this year, even with public displays of cooperation, the challenges remain steep. Of course, for some seasoned political observers, the current dynamic at the Capitol is to be expected — even when lawmakers agree on the focus, the devil is always in the details. Still, others wonder: In a session billed as one big campfire sing-along, what’s taking so long? The chambers have hardly stalled. A House committee is expected to vote on its budget proposal Monday. That budget bill, House Bill 1, could then hit the floor of the lower chamber by the end of March — the earliest House members have debated the only piece of legislation that’s constitutionally required to pass in several years. The Senate, meanwhile, has already unanimously passed its supplemental budget, which would put roughly $6 billion toward leftover state expenses, such as Hurricane Harvey recovery, and work continues on its own budget proposal. Still, the pace is notably more sluggish than the most recent legislative session, particularly in the Senate. By March 1, 2017, the upper chamber had passed all four of the governor’s legislative priorities — along with a controversial anti-“sanctuary cities” bill that would prove among the most divisive measures of the legislative year. This year, that same milestone came and went without even a public unveiling of the lieutenant governor’s priority bills. Those were announced a week later, in a Friday evening press release that included a host of priorities Patrick has made little mention of in recent months. Patrick has said the upper chamber’s slower start this year is by design — a chance for new leadership in the House to keep pace — but skeptics wonder if some of his priority measures simply don’t have the support to move. Still, with that cooperation ongoing, interchamber policy differences continue to dog Republican leaders, particularly on school finance — an issue that state leaders have long been promising to fix. After proposed overhauls ended in stalemate during the 2017 legislative sessions, a group of legislators appointed by Abbott, Patrick and former House Speaker Joe Straus spent months studying ways to improve the system as part of a school finance commission. That panel — including House Public Education Chairman Dan Huberty, R-Houston, and Senate Education Chairman Larry Taylor, R-Friendswood — released more than 30 recommendations aimed at addressing deep flaws in the state’s public education system. Now, the chambers have unveiled proposals that are at odds in significant ways. Surrounded by dozens of his House colleagues, Huberty unveiled a roughly 200-page bill earlier this month that would put $9 billion toward public schools and property tax relief. Days later, amid a Friday evening filing deadline, his Senate counterpart, Taylor, filed an incomplete version of his own bill. Unlike the House proposal, the Senate bill would institute some type of outcomes-based funding for school districts, paying them more based on how well third-graders perform academically. The House has proposed compressing property tax rates by 4 cents, meaning lower bills for homeowners; such a proposal doesn’t appear in the Senate version, at least in its current form. Beyond that, the Senate’s school finance proposal is difficult to scrutinize, as it’s not finished. Bettencourt said he and Taylor are still working on the meat of the proposal, a pitch for how to overhaul school district property taxes, which constitute a significant chunk of homeowners’ property tax bills. Until that takes shape, the tax chairman added, he’s not whipping the Senate floor for a vote on the property tax bill he filed in January. Perhaps the most notable break between the chambers is over teacher pay. All three state leaders have made clear that it’s a priority, but their approaches have differed: While Patrick has pushed heavily for a $5,000 across-the-board teacher pay raise — a measure that passed the Senate unanimously — Bonnen has suggested that he would prefer to let school districts decide how to best use their education dollars. Those differences sharpened earlier this month, when the House unveiled its school finance bill that instead proposed tackling the issue by raising minimum salaries for educators and increasing health and pension benefits, among other things. Through a spokesperson, Patrick acknowledged at the time that the two chambers “have taken different approaches” on the issue but emphasized that both remain focused on property tax and school finance reform. Last session, such stark policy differences might have devolved into interchamber finger-pointing. The 85th Legislature was defined by a showdown between Patrick and Straus, the former House speaker whom Patrick blasted as uncooperative and insufficiently conservative. Amid a policy stalemate, Patrick ended the legislative year by slamming Straus in the most insulting Texas terms. But this year, with a new speaker whom those on the right and left are still hesitant to criticize, leaders have taken care to give off the impression that negotiations remain on the rails. At least publicly, the “Big Three” have maintained the unified front that kicked off the session with joint press conferences hailed as historic. Bonnen, in an effort to keep negotiations running smoothly, told his top House lieutenants at a weekly lunch meeting last Monday to avoid publicly disparaging the upper chamber over differences on school finance. Bonnen’s message during that meeting, according to several people who heard the speaker’s comments, was clear: Let’s not poke the bear in the Senate. Patrick, meanwhile, told conservative activists in North Texas later that day that his “No. 1 goal this session” is to ensure Bonnen is re-elected as speaker in 2021. In a separate interview with Hasty, Patrick had made much the same point: “If we disagree, we’re gonna disagree without being disagreeable,” he said. But even if everyone’s playing nice, the thorny issues that have stymied lawmakers in sessions past aren’t getting easier to resolve. And the pressure is only mounting as they near the finish line — the official end, or “sine die,” to the session on May 27. The pace beneath the Capitol dome has some insiders quietly questioning whether the 140-day session will be long enough or whether the governor might need to call lawmakers back to Austin after May for additional work. For their part, state leaders remain confident the issues will be addressed this legislative year — no matter how long it takes.